Learn how to take more effective meeting minutes! Meeting minutes are the written record describing the discussions and decisions of the meeting. The meeting minutes should only be a summary of the discussion and decisions, rather than a verbatim account. If you are uncertain how to write meeting minutes, the use of meeting minutes software like MeetingBooster simplifies this process, improving consistency, accountability and overall effectiveness. A meeting minutes checklist lays out the various steps involved in setting up a meeting, and covers 4 main stages. This information is later included in the final minutes document. Preliminary Preparations - Topics such as setting the date, time and location of the meeting. Reminders and Agenda Packets – Meeting reminders, notifications and tentative agenda packets. Arrangements – Special guests, equipment and concessions. Final Preparations – Confirmations, final agenda packets and meeting minutes template. Action minutes - decisions reached and the actions to be taken, but not a detailed account of the discussion that went into making the decisions. Action minutes are the most common style of meeting minutes, and with any style, it is important that you note the start time, attendee's present and any opening remarks. As the meeting progresses the note taker must capture all important information covered during the meeting. It is sometimes difficult to accurately capture these topics, which is why the use of software is becoming more popular. 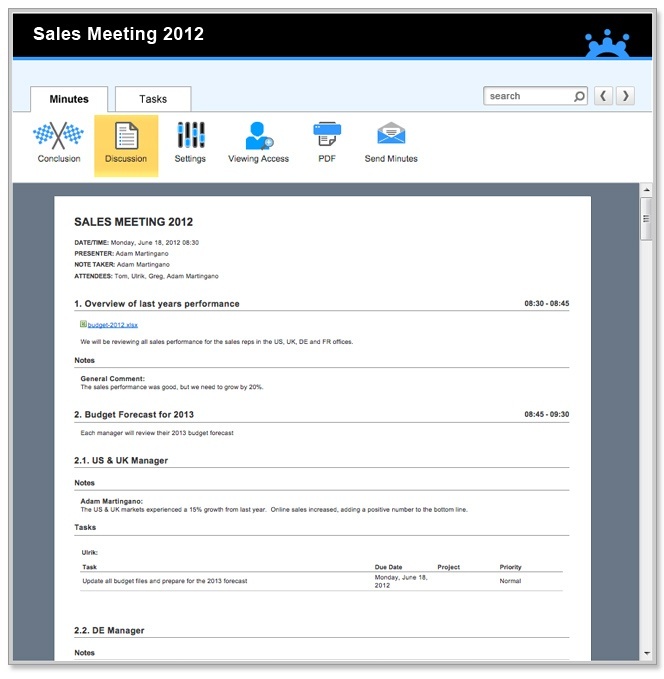 Programs such as MeetingBooster allow note takers to quickly enter notes based on a formalized agenda. Each topic can be selected, the corresponding attendee making a comment can be noted and any decisions made can be identified. When the meeting is adjourned, the note taker is responsible for reviewing and finalizing the minutes. This process can be tedious when using traditional programs like MS Word, and typically there is redundancy in that the not taker must re-type the captured information into a more formalized meeting minutes document. The document must be easy to distribute and in some cases must be archived. When using meeting minutes software like MeetingBooster, this process is automated. Meeting minute documents are created using professional layouts, capturing all important information and organizing it in an easy to review format. Users can distribute the minutes to attendees and teams with a few clicks and the documents are archived for future access and review.